August for me passed by so fast! I was doing last minute home remodeling, it was back to school week for Lyn, and it was also Little Lyn's birthday party. One of my cruelty-free beauty products is my new cover stick. Lavera cover stick is new to me, I hadn't used this brand before. What caught my attention is that it's vegan, and organic. One of the main ingredients is witch hazel. The consistency is thick and it's not easy to slide on your skin, but I like this because it means it will stay on your skin without fading throughout the day. In the past I have used Dr. Bronner's Pure-Castile soap in cherry blossom, but this time I bought Dr. Bronner's Pure-Castile soap in lavender. The lavender scent is subtle, and I keep it in my bathroom to use it as a shampoo. It leaves my hair clean, but I feel like it can by drying. I make sure to use it along with Not Your Mothers conditioner for really soft hair. I love Lush for their handmade beauty products, and for making their products vegetarian / vegan. This time I went back to buy again the Vanillary perfume, but the lady working at Lush recommended I use the massage bar. I loved the scent, which is a mix of floral and baby powder. I like it so much, and I have been using it for my skin. The residue is a bit oily, but I feel it hydrates my skin really well. I like how our home is coming out, and I keep adding more nature elements. 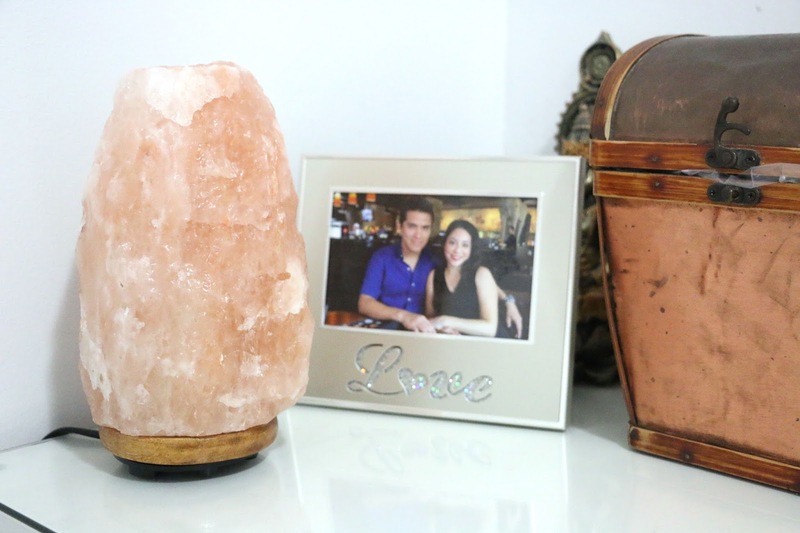 This time I bought a Himalayan salt lamp for our bedroom. Not only it looks cute, but it has many benefits. I helps you sleep better, alleviates asthma and allergies. You can also adjust how much light you want, but keep in mind this salt lamp is really heavy. Another favorite is how our living room wall looks. 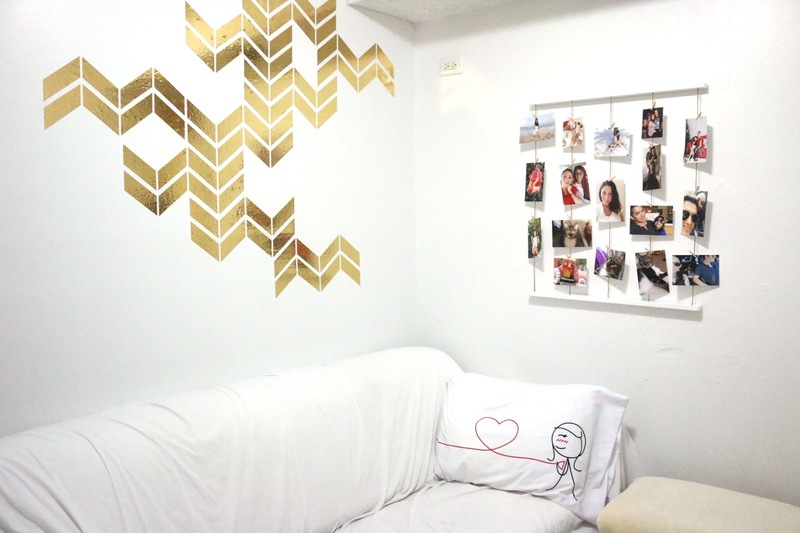 The wall was plain and I knew it needed something, so I thought about adding a Chevron wall decal. It's gold tone, and it looks amazing. It has a geometric sort of design, and it was easy to apply. The last addition for the living room was a way to display our family photos. I wanted something simple, and modern. Lately I have really been liking Umbra home decor pieces, and this time I found the Umbra photo display. 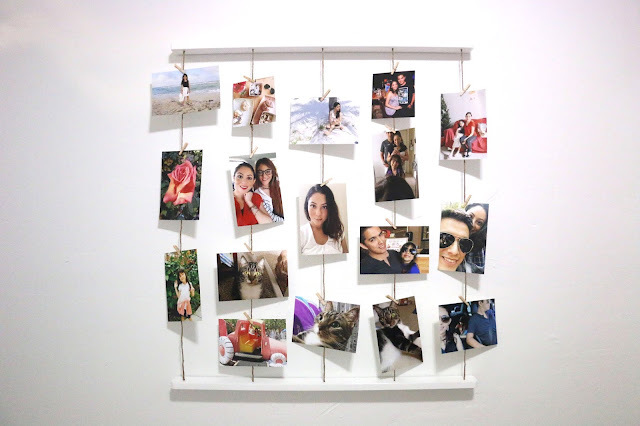 You can hang it vertically, or horizontally. I decided to apply it vertically to make the strings look straight down. It comes with all the mini clothespins, and also a set of card photos. Love it! These were my August favorites with cruelty-free beauty, and home decor modern pieces. ¡Agosto para mí se pasó tan rápido! Estuve haciendo remodelaciones en el hogar de última hora, era la semana de regreso escolar para Lyn, y también era la fiesta de cumpleaños para Pequeña Lyn. Uno de mis productos de belleza sin crueldad es mi nuevo corrector. El corrector Lavera es nuevo para mí, yo no había utilizado esta marca antes. Lo que me llamó la atención es que es vegano y orgánico. Uno de los ingredientes principales es hamamelis. La consistencia es gruesa y no es fácil deslizarse sobre la piel, pero esto me gusta porque significa que no va a desaparecer atraves del día. En el pasado he usado el jabón Pure-Castile de Dr. Bronner’s en flor de cerezo, pero esta vez compré el jabón Pure-Castile de Dr. Bronner’s en lavanda. El aroma de lavanda es sutil, y lo tengo en mi baño para usarlo como un champú. Deja mi pelo limpio, pero siento que lo puede resecar. Me aseguro de usarlo junto con el acondicionador Not Your Mother’s para pelo bien suave. Me encanta Lush por sus productos de belleza hechos a mano, y por hacer sus productos vegetarianos / veganos. Esta vez volví a comprar de nuevo el perfume de Vanillary, pero la chica que trabaja en Lush me recomendó usar la barra de masaje. Me encantó el olor, que es una mezcla entre floral y polvos de bebé. Me gusta tanto, y lo he estado usando para mi piel. El residuo es un poco grasoso, pero siento que hidrata mi piel muy bien. Me gusta cómo nuestro hogar está quedando, y sigo añadiendo más elementos de naturaleza. Esta vez compré una lámpara de sal Himalaya para nuestro cuarto. No sólo se ve lindo, pero tiene muchos beneficios. Ayuda para dormir mejor, alivia el asma y las alergias. También se puede ajustar la cantidad de luz que desees, pero ten en mente que esta lámpara de sal pesa mucho. Otro favorito es cómo se ve nuestra pared de la sala. La pared estaba sin nada y sabía que necesitaba algo, así que pensé en añadir un sticker Chevron de pared. Tiene tono dorado, y se ve increíble. Tiene como un diseño geométrico, y fue fácil de aplicar. La última adición para la sala era una forma de mostrar nuestras fotos de familia. Yo quería algo sencillo y moderno. Últimamente me han gustado las piezas de decoración de Umbra, y esta vez encontré el organizador de fotos Umbra. Se puede colgar verticalmente u horizontalmente. Decidí aplicarlo verticalmente para que las cuerdas se miren recto hacia abajo. Viene con todos los mini ganchitos, y también con un set de fotos de tarjeta. ¡Me encanta! Estos fueron mis favoritos de agosto con belleza libre de crueldad, y decoración del hogar con piezas modernas. Umbra has some great products; I used to work for someone who was a sales rep of theirs so I would get tons of stuff for free! I really want to try that massage bar from Lush too. Great list! Great list and really nice blog. Love the look of it. Thanks for sharing. Love these picks, anything to do with Lush is always on my favourites list! I think we'd be best friends ;) Dr. Bronner's Castille soap is my absolute favorite to use & I also love the benefits of a salt lamp! Xoxo! I ordered a Himalayan salt inhaler that should be arriving in a couple of days. I can't wait to use it! If I like it, I am going to get a lamp too! My sinuses need it in the Fall and Spring.